The Derek goes for a hike. Sorry for the title, couldn’t help myself. 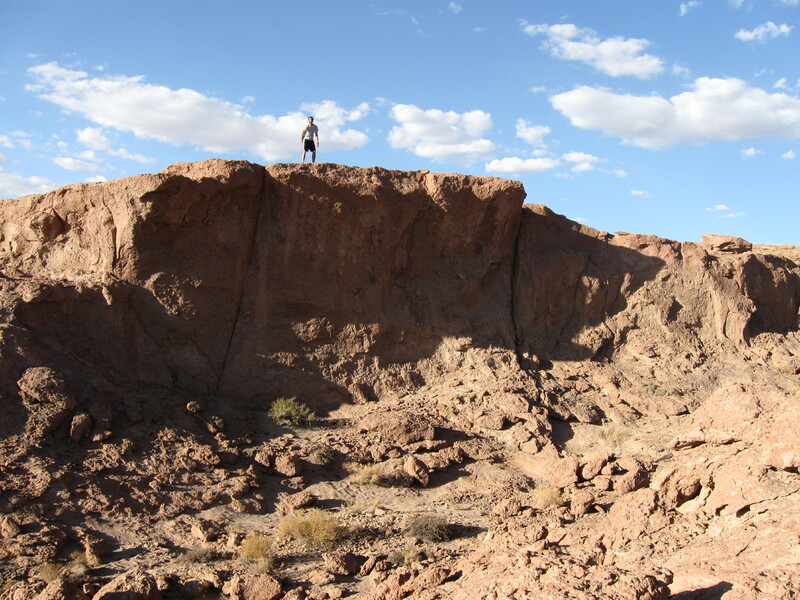 Anyways, work progressed pretty good and by late Sunday afternoon (7pm) we decided to go for a short hike. There aren’t much in the way of hiking trails, but there aren’t much in the way of tree’s to get lost in either; so we just chose a direction and went. 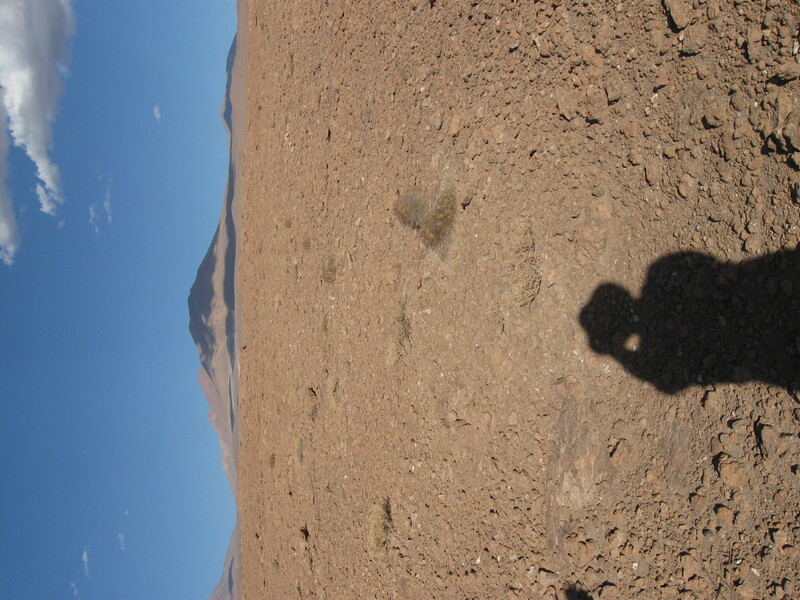 Taking a picture of my shadow in the Atacama Desert. 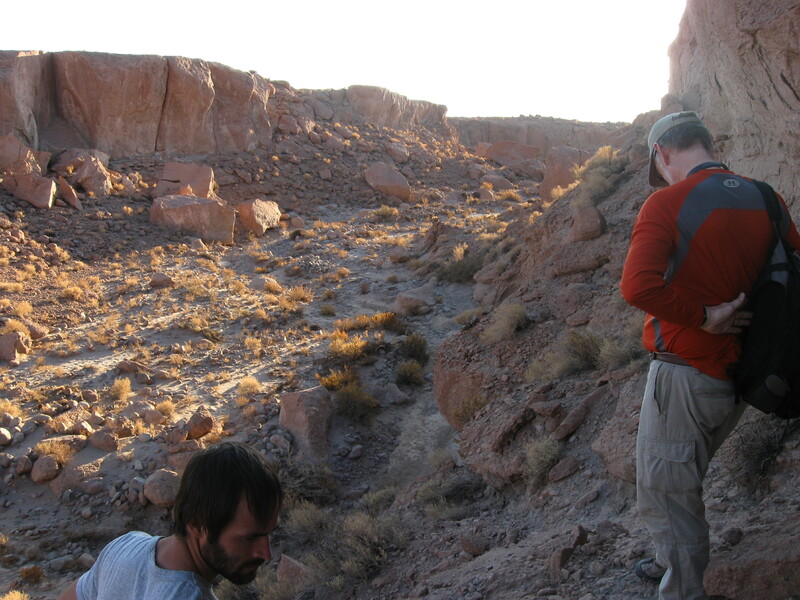 The big attraction near our work site are the numerous canyons that you can explore and climb through. Most weren’t too big, but we would follow the canyon up for a few hundred yards and explore. We wondered when the last time water flowed here. 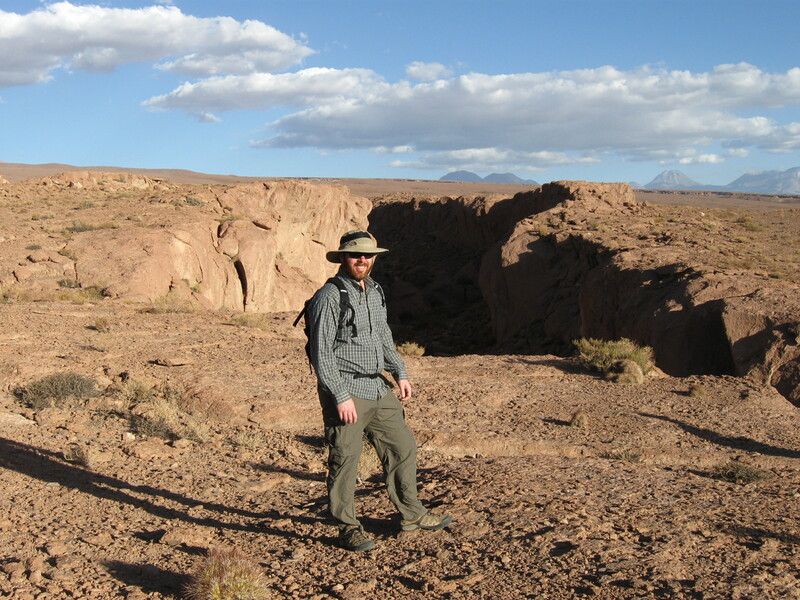 Kevin taking an alternate route around a canyon. 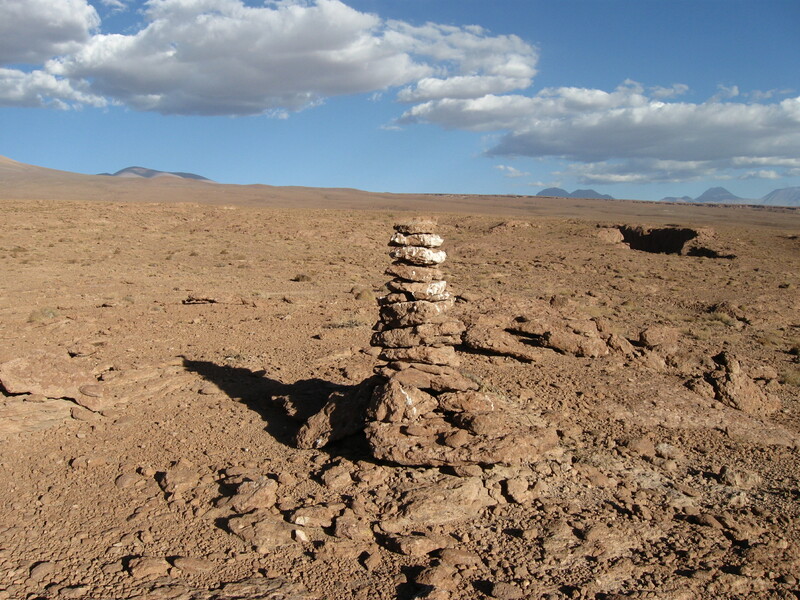 There were cairns marking the best route across the canyons, although we didn’t always look too hard for them. Although the sun was setting, it is still an extreme climate and the chance of my pasty white skin burning to crisp was at the forefront of my thoughts. We are at 10,000 feet, there is no shade, little moisture and an extra thin ozone layer. This is great for astronomical conditions but bad for avoiding skin cancer. I hadn’t really expected to do any hiking on my first trip to the site, so I had to improvise my clothing. 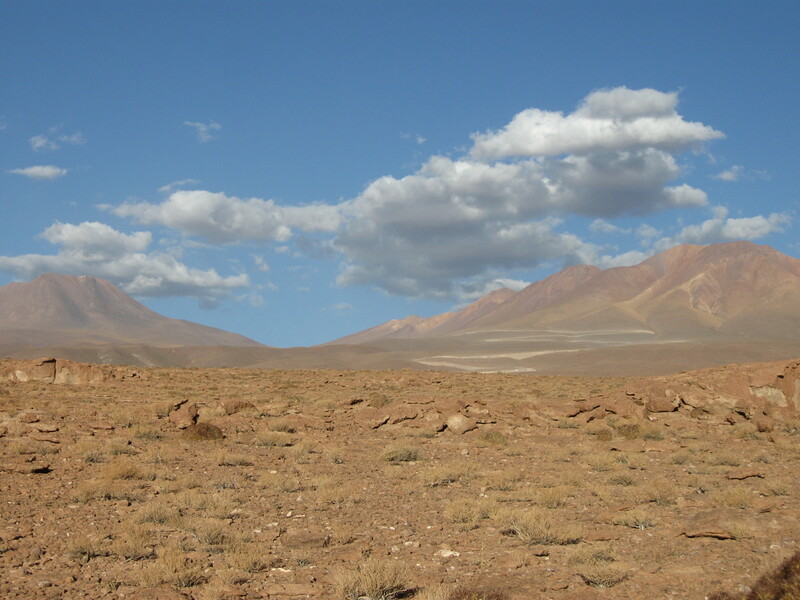 The mountain to the left is lower than the observation site, but there are dormant volcanoes within view that are over 20,000 feet! This is one of the chief attractions of the area and there are daily tourist excursions near to the top. Maybe one day I will have enough time to go up myself. Art, Kevin (co-workers) and myself finally came to a canyon we couldn’t cross. We went up and down looking for a way to cross, but it proved elusive. Finally we found a sketchy way down. There was a lot of donkey tracks and poop, but no wild burro’s I had heard so much about. I wondered what they were doing in the canyons in the first place, but then I could see some wet spots were water might have pooled in the morning and I thought that’s where they might get their drinking water from. Maybe pool is a strong word for it, probably more like dig around in the mud for a murky drink? We explored the bottom of the canyon a little bit, and then found a cairn that marked a much easier path out of the canyon. At this point the sun was beginning to set and we decided to head back to camp. Luckily it was always within view and easy to find our way back to. In the picture above, you can see the large building that I work in. This is actually the subcontractor’s building, but it’s where I spend most of my time. There are actually 3 different assembly points in the left half of the picture, one for the American telescopes, one for the European telescopes, and one for the Japanese telescopes (all working on the same overall project). The Americans were the only ones to build a real building, and its quite huge. We have some telescopes inside being worked on, and some others outside being tested. Having a building to work inside is certainly a plus. 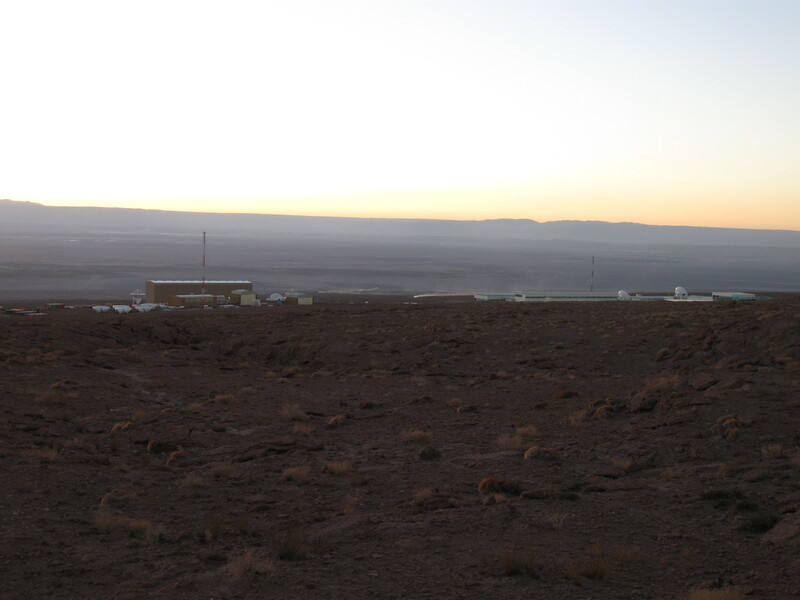 Also in the picture to the right are the main offices for the ALMA site operations. 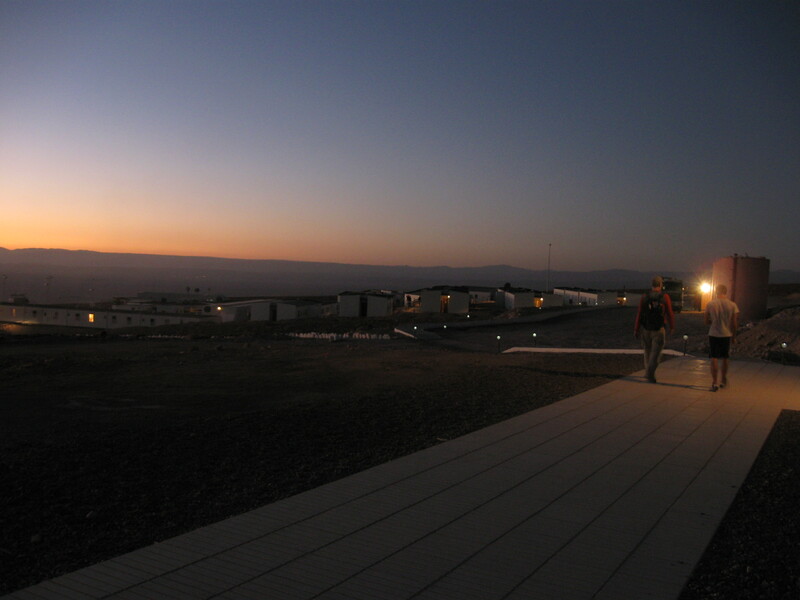 This is where the telescopes have their final assembly and testing done before heading to the high site and where all the facilities are. Back to the hike, we still were exploring on our way back. We kept on running into these deep holes located randomly in the canyons we came across. 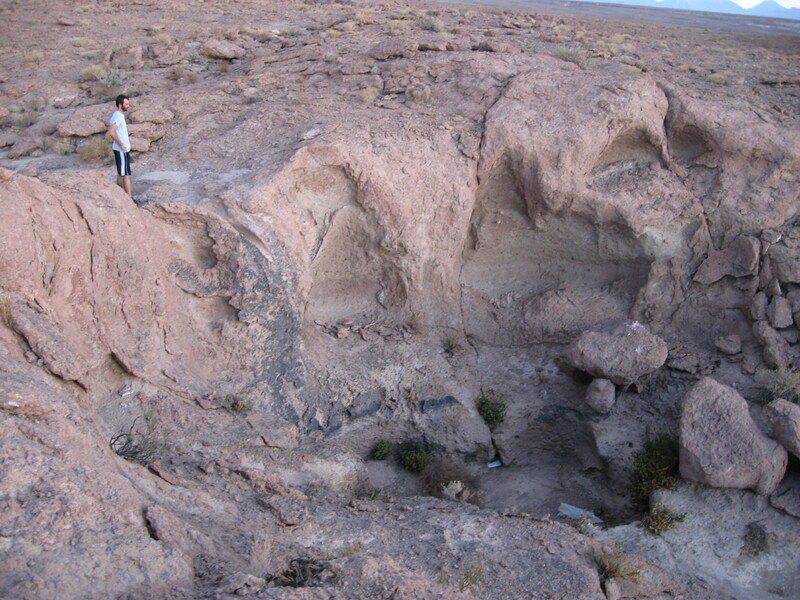 Some of them looked like lava tubes, but I think they are more likely formed by old waterfalls. Hmmm? We finally made it back to our work site just as the sun was setting. Question: how many buildings here are made out of old shipping containers? Answer: pretty much all of them. 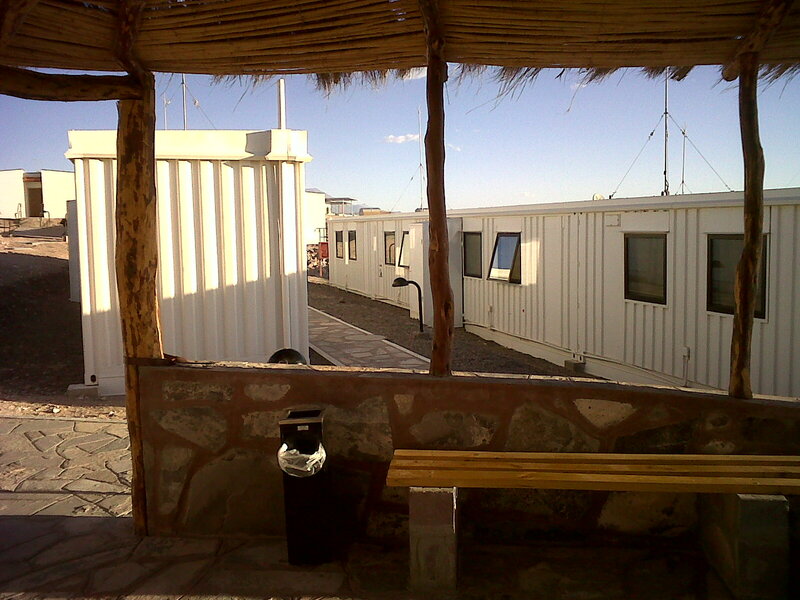 Okay, so my dorm room I will usually stay in is an actual building, I did stay in converted shipping container for a few days. It really wasnt that bad. Also to the right in the picture are the water storage towers and a water delivery truck. Water is delivered several times a day every day. Anyways, a few more days of work and then I was released back to the civilized world of Santiago. Next adventure: finding an apartment! This entry was posted on February 21, 2010 at 8:56 pm and is filed under Uncategorized. You can follow any responses to this entry through the RSS 2.0 feed. You can leave a response, or trackback from your own site. Great report Derek. I look forward to be one of your first guests in about February 2011. Interesting pictures but a little bleak for my liking.I’m a tree man myself,preferring forest to desert. disturbing those rocks angered a scorpion or rattler. I expect you are well informed with the current situation between Argentine and the UK. Won’t they ever learn? We trashed them in the Falklnds episode of ’82 and now they want other S.American states to join them and oust the white man. Chile is our closest ally with weekly flights by LAN Airways from Santiago to Falklands. I hope any threat of war doesn’t spoil your opportunities over there. Rest assured if push comes to shove those Argies will learn once and for all it doesn’t pay to stand on the lion’s tail even if those Frenchies keep supplying them with Exocets.